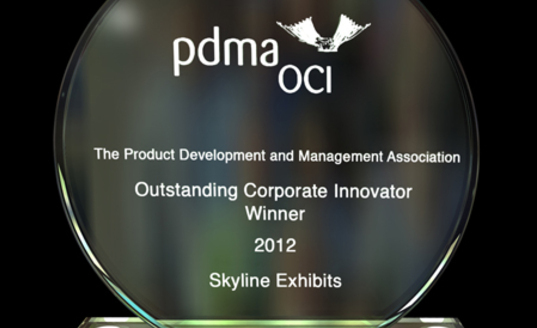 ST. PAUL (September 2012) -- The Product Development and Management Association (PDMA) announced that Skyline Exhibits has won their coveted Outstanding Corporate Innovator (OCI) Award. The OCI is the only global innovation award that recognizes companies for demonstrating sustained and quantifiable success in developing new products and services. For over 25 years, the OCI Award selection process has identified companies that create and capture value through innovation in developing new products. The prize recognizes sustained success in launching new products, growth from new product success, well-defined development practices and processes, and distinctive innovative characteristics and intangibles. The OCI selection committee, comprised of ten of the world's leading innovation and new product development experts, selected the trade show products and services company after a rigorous nine-month selection process. "We are honored and very excited to win this award," stated Bill Dierberger, President, Skyline Exhibits. "It recognizes the culture of innovation that is at the core of this company, and has been since we were founded in 1980." This year the PDMA named three winners. The others are the Clorox Company and Faurecia Automotive Seating, the world's sixth largest automotive supplier and long recognized in the automotive industry as a leading technology innovator. Past OCI Award recipients include some of the largest, most recognizable brands in the world. A few of the winners are Apple, Bausch & Lomb, BMW, Chrysler, Dow, FedEx, Harley-Davidson, Herman Miller, Hewlett-Packard, Merck, PepsiCo, Xerox and a host of others. Last year's winners were Illumina, Inc. and UnitedHealth Group. Skyline is the first company from the exhibit industry to win the OCI award. "The award confirms that our front-end approach of identifying market trends and defining unmet customer needs is paramount to creating products that are so well received," stated Jon Althoff, Director of Global Marketing, Skyline Exhibits. "In fact, twenty-four percent of current sales are attributed to products that did not exist five years ago." Skyline is committed to customer-focused innovation. "Innovation is a vital part of who we are because we strive each and every day to provide novel solutions to our customers' challenges," added Dierberger. "This award is validation that we provide exhibiting solutions better than anyone else in the industry." Skyline and the other winners will receive their award and present their stories during the Product Innovation Management Annual Global Conference hosted by PDMA in Orlando, Florida in October. Skyline Exhibits is North America's leading brand of exhibit systems. Known for high-quality manufacturing, cost-saving portability, innovative functionality, creative design and exhibitor education, Skyline has nearly 100 Design Centers in North America and representation in 40 countries. The company manufactures a broad range of products for trade shows and events -- from banner stands and pop-up displays to large custom modular exhibits. With 20 integrated exhibit systems, state-of-the-art production of large-format graphics and options for exhibit rental and services, Skyline provides exhibit solutions for virtually any size or budget.